KIEV, Ukraine -- Ukraine's army was too weak to defend itself in March. Not anymore. The Ukrainian airbase at Kramatorsk, a short drive from the border with Russia, was a sorry sight just a few months ago. Ukrainian troops patrol near the village of Novoselovka, some 30 kms (19 mi) from the eastern Ukrainian city of Donetsk, on July 31, 2014. The road leading up to it was strewn with barricades of trash, and pro-Russian separatists liked to gather around it for little victory picnics of beer and sunflower seeds. They had blocked the main gate to the airfield in early April, and rather than forcing the separatists back, many of the Ukrainian soldiers based there from the 25th Airborne Brigade had deserted. One of the few who remained on the evening of April 19 was sulking over his army ration when two reporters came up to the base and asked about the unit’s morale. “On a scale of one to ten,” the soldier said, and raised three fingers of his left hand. In early July the base at Kramatorsk became the nerve center for the military operation against the separatist militias in eastern Ukraine. Every few minutes on an average morning tanks and armored vehicles now stream in and out of the gate in columns, heading for the front lines. Helicopters fly over the heads of Ukrainian snipers, and the commandos guarding the main gate would not look out of place in a remake of Rambo. Their fighting spirit seems plenty high. “You’ll see us yet in Moscow, marching in Red Square,” bragged a captain from the revitalized 25th Airborne on Wednesday morning, standing outside one of the towns they had taken back from the separatist rebels the day before. This was not much more than empty bravado—Ukraine’s army is still a fraction the size of Russia’s—but the sentiment behind his threat is still a bad omen for Russia’s security. At least in military terms, Russia’s logic in starting the conflict in March was to strike first against a potential enemy. Its commander in chief wanted to pre-empt what he saw as a future threat to Russia’s naval base at Sevastopol, on the Crimean peninsula in Ukraine. This was a pretty far-fetched prospect at the time. The NATO military bloc, Russia’s enemy during the Cold War, had rebuffed Ukraine’s request for membership in 2008, and two years later, Ukraine’s parliament voted to drop all plans of joining the alliance. Putin’s generals still felt the danger of NATO appearing in Crimea was serious enough to justify a pre-emptive move, and they pulled it off. But the cost to Russian security has since been growing by the day as Ukraine’s armed forces grow stronger. In exchange for stopping the hypothetical approach of a potential enemy in Crimea, Russia has created a very real enemy all along its border with Ukraine. 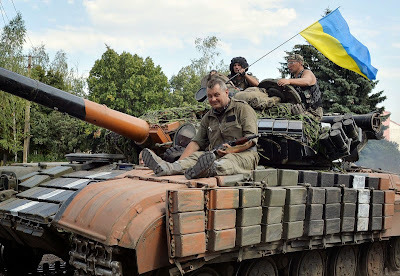 Over the past few months Ukraine has rushed to revive its armed forces after two decades of mismanagement, corruption and a false sense of security which, among other things, lulled the military-industrial complex into a sort of prolonged hibernation. Now reservists are being called up to serve after years away from their bases. The Ministry of Defense has ordered idle weapons plants to renew production, including a thousand armored personnel carriers. The newly created National Guard has received tens of thousands of volunteers to fight in eastern Ukraine, and a handful of paramilitary battalions have assembled thousands more. Perhaps most telling of all, there was no public outcry when Ukraine reinstated the military draft in May, nor when the parliament voted on July 31 to impose an extra 1.5 percent income tax across the country to help fund national defense. Ukrainians have recognized the need to have a formidable army, and they are prepared to sacrifice for its creation for the first time in their post-Soviet history. For that they have Russia to thank—and Russia has itself to blame. In the spring, the Russian military would have faced little resistance in Ukraine if Putin had given the order to march across the border and conquer all of the country’s eastern and southern provinces. Indeed, a top NATO commander estimated in April that Russia could accomplish this in under a week. But now it would face a much more resilient opponent. In a nationwide survey conducted in May, 14 percent of respondents said they would volunteer for the army in case of a Russian invasion; 10 percent said they would engage in “underground or partisan activity” against Russia, meaning, in essence, guerrilla warfare. So if Russia was hoping to steal a swift march on eastern Ukraine, it has missed its window of opportunity. A Russian invasion would result in a protracted conflict, one that could start to eat away at Putin’s popularity if Russian soldiers start coming home in body bags from an obvious war of aggression. That may be why the Kremlin seems content to keep funneling support to its proxy militias in eastern Ukraine for now. But at the current pace of its advance, the Ukrainian military will be able to rout the separatist rebels in a matter of months, if not weeks. “Then we will have to fortify our borders,” says Sergei Savitsky, a major in the Ukrainian engineer corps. Sitting on the bank of the Bilenka River on a recent afternoon, Savitsky watched his fellow soldiers build a sturdy pontoon bridge, replacing the one that the rebels had blown up while retreating in early July. It seemed like a remarkable feat for an army that didn’t even have enough uniforms to clothe its soldiers in Crimea a few months ago, and it was hard not to wonder how they pulled it together that fast. “We always had the skilled men, the raw material,” Savitsky said. Now Russia has provided that wake up call, and whatever threat the eastward creep of NATO may have posed, it would not have advanced as suddenly or as tenaciously as Ukraine’s military revival.